My research focuses on educational evaluation, and especially on the potential and limits of evaluation to support democratic ideals and promote justice in education. I have long been concerned with the intended and unintended consequences of government mandated accountability on teachers, students and quality of education. Over my career, my research has lead to a deep commitment to public education, the right of all children to a high quality education that is broad in scope and inclusive of all learners. I have conducted national large- and small-scale evaluations of K-12, post-secondary, and informal educational programs and curricula; published articles in the leading evaluation journals; and edited and authored a number of books. Institute for Public Education/British Columbia: Dr. Mathison is one of several co-founders and currently Executive Director of the newly formed (2016) IPE-BC, an Institute that supports public education that promotes the common good for all British Columbians. IPE is primarily an information portal for media, teachers, parents and communities to make available in accessible ways scholarly research and conversations about public education. The Institute has approximately 50 Fellows who are academics, educational activists and community leaders who are committed to public education in a truly democratic society. Institute for Critical Education Studies: Dr. Mathison is co-founder and co-director of the Institute, with E. Wayne Ross and Stephen Petrina, and co-editor of one of the Institute’s flagship open access journals, Critical Education. The Institute for Critical Education Studies was formally established in October 2010 to support studies within a critical education tradition. ICES maintains a network that conducts and circulates cultural, educational, or social research and discourse that are critical in method, scope, tone, and content. Critical Education Week is a weekly online newspaper featuring stories about education from around the web and around the world. Great Schools Project: Dr. Mathison was a key member of the GSP, which declared it’s role complete in 2015. The Great Schools Project was a collaboration among individuals interested in strengthening and protecting education in British Columbia. The GSP included committed educators, parents, researchers, and leaders, both inside and outside of the education system, working to improve the current provincial accountability system. Many members of the GPS have affiliated with the newly formed Institute for Public Education. Mathison, S. (2016). Confronting capitalism: Evaluation for social equity. In S. Donaldson & R. Picciotto (Eds.). Evaluation for an equitable society. Charlotte, NC: Information Age Publishing. Ross, E. W., Mathison, S. & Vinson, K. D. (2015). Social studies education and standards-based education reform in North America: Curriculum standardization, high-stakes testing, and resistance. In special issue on Social Studies Education, Gustavo A. González Valencia and Antoni Santisteban (eds.) La Revista Latinoamericana de Estudios Educativos (Latin American Journal of Educational Studies). Mathison, S. (2014). Seeing is believing: Using images as evidence in evaluation. In S. Donaldson, C. Christie & M. Mark (Eds.) Credible and Actionable Evidence: Foundations for Rigorous and Influential Evaluations. Sage Publications. Mathison, S. (2014). Making assessment work for teaching and learning. In E.W. Ross (Ed). The Social Studies Curriculum: Purposes, Problems, and Possibilities, 4th Edition. Albany, NY: SUNY Press. Mathison, S. (2009). Public Good and Private Interest: A History of Educational Evaluation. In W. C. Ayers, T. Quinn & D. Omatoso Stovall (Ed.) 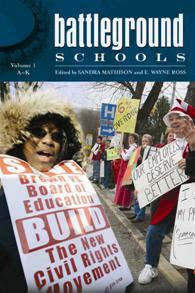 The Handbook of Social Justice in Education. London: Routledge. Mathison, S. (2009) Educational evaluation and the social good. In C. B. Cousins & K. Ryan (Eds.) 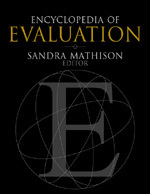 International Handbook of Educational Evaluation. Sage Publications. Mathison, S. & Ross, E.W. (Eds.) (2008). The Limits of Standards Based Reform and Testing. New York: Teachers College Press.Freeman, M. & Mathison, S. (2009). 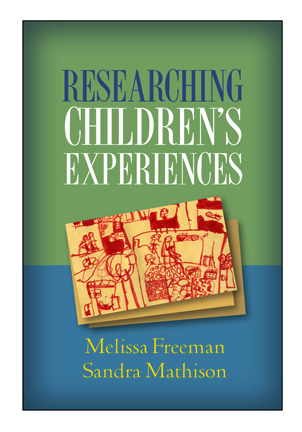 Researching Children’s Experiences. New York, NY: Guilford Publishers. Freeman, M., Mathison, S. & Wilcox, K. (2006) “I hear when. I don’t hear what:” Performing parental dialogues on high stakes testing. Cultural Studies « Critical Methodologies. 6(4). Mathison, S. (1996). Evaluation as a democratizing force in schools. International Journal of Social Education, 11(1). Mathison, S. (1991). (Ed.). Authority in internal evaluation. A special section of Evaluation and Program Planning, 14(2), 157-198. The Impact of High Stakes Testing: Clicking on the title will take you to a description of my research on the impact of high stakes testing on schools, teachers, and students. You will also find links to published work and conference presentations on this topic.